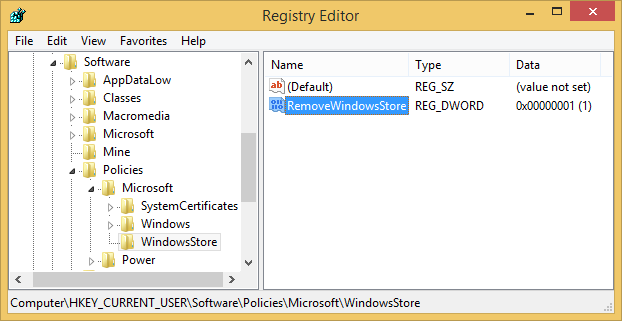 In windows 8.1 enterprise there was a group policy to disable the Store app. In Windows 10 enterprise that GP is missing. How can we disable the Windows store in Windows 10 Enterprise. We don't want our users using , browsing or doing anything with the Windows store. These are work computers! Yes, This is the setting that was in Windows 8.1. It is not in the Windows 10 Enterprise July 2015 build. I've just done that, and the settings are now available to me. There is a version of enterprise called Long Term Servicing branch (LTSB) which has no "start" screen, Store, and other media features. Generally it is used in mission critical situations. Also if you disable User account control it will disable all store apps, etc. We don't want to use the Long Term Branch Version. Even Windows 8.1 had a way to prevent the users from using the Store application. Don, your solution does not work on Windows 10 Enterprise July 2015 build. I just installed the windows 8.1 .msi file from your link and nothing shows up in GPEDIT.MSC on the local computer. We don't use active directory at all and this MSI you provided the link to does absolutely nothing. It goes through the install, completes but there is absolutely nothing as shown in your screen shot about store. Don, Why you would even use Windows 7 as a test is just weird. We are working with Windows 10 Enterprise NOT windows 7, so your solution is useless. Windows 7 doesn't have a store so not even sure why you would test this at all on Windows 7. Again, there is no solution for Windows 10 Enterprise. Just another example of the idiotic development environment over at Microsoft. Useless. Using Windows 7 isn't the issue. In fact, it's just proof that the template is able to be used and the newer features are able to be managed no matter what client you are running. It's a good thing. Windows 8.1 templates can NOT and I Repeat NOT be used in Windows 10 Enterprise July 2015 Build. Again, if anyone is having or facing this issue understand that the solution telling you to use Windows 8.1 templates is a useless and completely false statement. Please Note Below that HKEY_LOCAL_MACHINE will not have the dword RemoveWindowsStore. You need to create it. I logged in as a standard user and the store was blocked. In spite of your tone, I just verified Don's solution of inserting those two template files among the Windows 10 templates, and was able to configure and block the store application through policy. Should Microsoft include this in the Windows 10 GP templates? Absolutely. I'm not sure why they're not there. Not my area, I'm afraid. You are correct. The ADML and ADMX files I copied over from Windows 8.1 machine and placed in same locations. It IS working. However, the first time I did it the machine locked up so I said they didn't. Both the registry key and those GP templates do work. The red dots in my screenshot illustrate the setting for Store. Whether you use AD or not, Group Policy Admin Templates, is exactly the same. When you download the templates MSI, the templates will be extracted to a folder (the folder is a prompt during the installer process). After extraction, you must copy the ADXM/ADML files to the \PolicyDefinitions\ folder on the target machines, or, to your Domain Controllers, or, to your Central Store. You can then use GPEDIT or GPMC or AGPM or whatever Group Policy implementation method you wish. These steps are not explained in the MSFT Download centre information. It is assumed that you know what to do with the files. It is also assumed that you have a good understanding of how Admin Templates actually function, and, that you have a good understanding of how Windows Group Policy (as distinct from Office Group Policy), is largely version-agnostic. When you replace an existing ADMX/ADML fileset, the Windows team essentially accumulate settings, in a rollup fashion, incorporating newer settings into the updated files, without losing any older settings. (* as a general rule). This means that the version of Windows I am using is completely irrelevant, and, the version of Windows I may use in the future or at various times, is also completely irrelevant. As I suggested earlier, Group Policy questions are more suited to the dedicated GP forum. Sorry for assuming a little too much about your GP competence, and I get your frustration. I still get frustrated at the easily-fixed dumbness of much of this stuff, and I've only been working with it for 20 years or so. I've gotten a bit numb to all, I guess. Thanks for coming back and verifying your results, this helps me to know that the advice I gave was useful (even if obtuse), and others searching in future can find it (somewhat) useful. :) Made me laugh, thanks! Pretty sure update 1511 broke this function. Group policy or manual registry setting no longer have an effect. "Turn off store" - Enabled. Windows 8.1 = Store Block, Windows 10 = Can still access store. Same thing for disallowing access to login or create a Microsoft account too, has anyone noticed this? I had the problem with the WindowsStore.admx and WinStoreUI.admx shown on this article. I had to remove the older WinStoreUI.admx to stop constant errors. 12-03-2015 - I spent days.... looking for a solution to this issue. On Windows 10 Pro, not in an enterprise, this Reg hack worked. This approach also makes it easy to remove as needed. So, thanks! but that is not the same path as is displayed in the screen shot! I'm having the same problem. I have downloaded the latest 1511 ADMX templates from Microsoft and installed them in my central store. I have a fresh Windows 10 Pro 1511 (10586.29) build. I can't even see the GPO being applied when using GPRESULT on the machine. As a test, I created another GPO that didn't have Windows Store settings and it applied to the machine perfectly...I'm at a loss. Dan, can you see if your GPO applied via gpresult and let me know? What? Why? That's ludicrous. Not all organizations use the Enterprise version. Do you have a source to reference for this? Would love a source or a reason given too. We are a small business (9 machines) and Pro has always served us well. We just bought all new Dell machines for the office, and our pre-purchase test was done with build 10240 when this policy worked. Now MS just decides to make a core change to the OS? I'm with you. I can't imagine that this is true. I'm more or the opinion that its probably just broken. I have not seen any documentation, but I validated the behavior had changed with right team before I posted that it had been different for TH2. That is terrible news, I've been trying to figure out why my policy stopped working. I'm hoping this gets changed, as it doesn't make a whole lot of sense to me...has anyone found a work around for this? Say WHAT!???! As sckbassg3 says, that's absolutely ludicrous.. Please provide your reference! I can confirm the "Turn off the Store application" setting still works on Windows 10 Enterprise. Sorry, for the rest of you. Hope you get answers to this. I don't think you'll get one here in these community forums. Nothing in here is really official. I think the closest thing you'll get, is what Darrell has already said. If you want a formal response on this from MSFT, I think you'll need to raise a support case, or enquire via your MSFT account team/executive/TAM/SDM/whatever. We're running windows 10 Education and are running into problems disabling the app store and app updates. The main reason for disabling is our internet usage is capping out because of all the windows 10 devices hammering it with app updates. Though I don't really want the app store enabled on our domain joined computers anyway. I first tried copying the windows 8.1 admin templates as suggested. This however created a conflict with existing templates when I opened group policy, so I deleted them from our policydefinitions and reopened Group policy. Upon opening group policy I could see the 'Computer config > Polices > admin template > windows components store > Turn off the store application' settings there anyway, so I configured these. They appear to have successfully created the RemoveWindowsStore DWORD in the registry of computers picking up the policy. However the store still runs for all users. Only enabling this for enterprise is ridiculous. We are currently evaluating the rollout of Windows 10 Pro for 500+ computers and we cannot disable access to the store but only disable all apps completely? That's truely a show stopper! I just tested and indeed, it seems that the GPO setting only work on Windows 10 Enterprise. At least, Microsoft should update the info on the GPO because the information is incorrect. Yes, plus all three other options still work on Windows 10 Professional as well. Edit: I have confirmed that the other GPOs work. It is possible to block users from launching apps from the store or downloading apps. However, the built in Windows Store apps (Finance, Sports, etc.) still work. If you remove them and then try to re-add them from the store, they will be blocked. Are there any other group policy settings that are Enterprise sku only? As the template spreadsheet is silent as to which ones are effective in a specific sku. In the ADMX for Windows 10, you have a new entry :"DisableStoreApp". This is a new key in HKLM\Software\Policies\Microsoft\WindowsStore\DisableStoreApps. And if this valus is 1, Windows store is disable. Because you activate the desactivation of Windows Store. So "<enabledValue>" need to be at 1, so you need to switch value on WindowsStore.admx file. ANSWER: It's not working because Microsoft disabled the ability to block the store in the 1511 update. This was on purpose according to Microsoft as they want the app store to be apart of there core apps and if people disable it then you wont get core apps for Windows.. I think that it is absolutely ridiculous also and have called Microsoft multiple times complaining about it. They were able to send a ticket to some of the Microsoft engineers to address this issue but I have not heard back yet. This is just ridiculous, a company should not be forced to use Store Apps... I have tried to disable store apps using the local group policy editor, and I did it with a local administrator account... However, when I logged on to the same machine using a domain based user account, all the apps still there, and I am still able to launch and use the store apps app... Microsoft, you better fix it soon!!! more info: How do you forcefully remove apps in Windows 10? Wow, I stumbled on this thread and have to say, the only thing ludicrous here is the tone of *some* of the people who are asking for help and then lashing out rudely, even in the face of their own ignorance. Thank you to the moderators and community volunteers who have provided valuable technical (and might I add, FREE) advice in this thread. I don't think you are grasping the fallout of this. As an Admin, you deploy Windows 10 Pro to your users with a GPO to turn the Store off that worked and then and update comes out and enables the Store allowing your users to install games, apps, etc... This is an escape that will make any company question whether to deploy Windows 10 to their environment since they don't know what could change next. I question the integrity of this O/S now and will relay this to other Admin's at sister businesses so they are aware of this. Are you saying that your users have rights to install software? Many businesses do not grant users the rights to install software, so I don't really see the issue. I guess if your users are all "admin" or"super users" then you have bigger issues :) Or are you saying that by having the store they can install even though they don't have the rights? Just trying to understand. You don't need admin rights to install a Store app... A standard user can if he is allowed to configure a Microsoft Account on the Windows Store. I have tried a few options available on the web, but none of them worked. Which of the above settings reached your goal? Registry Key 3 or 4? Yep, worked for me as well! Thank you! At the end, My Goal was only to Block Microsoft account to login or use windows store. None of those tweaks worked for me, so that led me to go further, disabling Windows Store via GPO. Policy works, now I am only struggling on two issues. Getting rid of the Store icon on the task bar and getting rid of the "Suggested Microsoft apps on the Start menu (GPO called Disable Cloud experience also doesnt work, I am still getting facebook app as suggested). There is also a policy for this specific case called (Show Windows Store apps on the taskbar on the User context), but it doesnt seem to work for me. Disable the policy that prevents logons with Microsoft Accounts. Users subject to this policy can still browse the store but can't install apps from the store. Similarly, such users won't be able to perform MSA-dependent operations like using Cortana, OneDrive. And WHICH GPO does the very entry on W10 Enterprise?